One night, while searching for Colorado records on a certain online auction site, I stumbled upon this 78 rpm record, from a seller in New York. I had never seen a pre-Colorado State University recording, and at $9.99 and free shipping, I didn't think twice to "buy it now." After I received it, I did a search for any information, only to come up empty-handed... that is until I contacted John Hirn, the volunteer athletic historian for Colorado State University, Fort Collins. "That record is somewhat of a legend in CSU history," he said. "I don't know the exact year it was produced, but sometime around 1953 is the best I can give you." "The Fight Song you have on this record is the original incarnation of what CSU has as our fight song today," Hirn added. "It was written around 1928 by Dr. Richard F. Bourne, but not commonly used until later on in our history. You will note they say 'Fight on ye Stalwart Aggie Team' rather than 'Fight on you Stalwart Ram Team' like we do today. There are other subtle changes to the lyrics of the 1950s version and today's fight song. 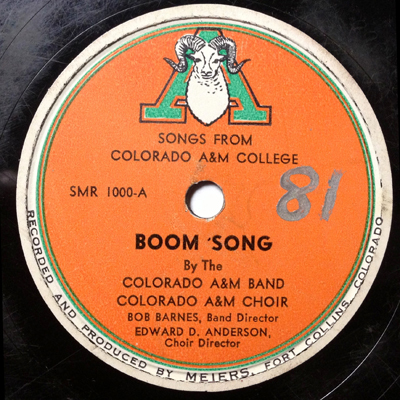 'Aggie Boom Song' was another original Aggie song sung beginning in the 1910s and used into the 1950s." 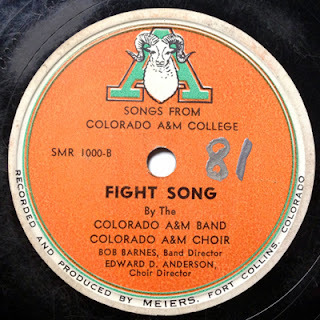 "'On Wisconsin' is in there because the original fight song for CSU was called 'Come on Aggies' and it was sung to the tune of 'On Wisconsin.' It dates to 1915 and was used until 1955 or so," Hirn said. I was curious about the mascot (the ram) and the use of "aggies" in the song. Again, I turned to Mr. Hirn. "In 1945, Colorado A&M students voted to adopt a ram as the school's mascot, and for the next 20 years there was a struggle among students, alumni, and other fans to call them the Aggies or the Rams. Finally in 1966 the school totally dropped Aggies as a team nickname. The ram logo was being used more and more in the 1950s. Our football helmets had ram horns on them, even though our 1955 basketball team wore uniforms with "AGGIES" written across the chest. A different ram logo seemed to pop up constantly at this time. So this logo, which has an "A" along with the ram head, is a perfect example of how the school was known by both nicknames."